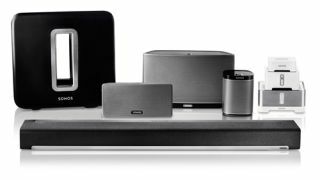 Sonos set to remove need for wired connection | What Hi-Fi? Sonos has revealed that it's working on new software that will remove the need to have the first Sonos product in your system wired to your router. "Advanced WiFi software" will ensure the SonosNet mesh network – the network created by the products in a Sonos wireless system – maintains "unrivaled reliability" without the need for the first wire in your system. Currently, a Sonos system requires that one product is wired to your router in order to kick-start the creation of your Sonos network. The Sonos Bridge was released to fill this role for many people. Of course, if you only have one Sonos speaker, say the Play:1, then that would have to be wired to your router, which somewhat puts a crimp in your wireless style. It's easy to see this news as another push from Sonos for its speakers to be seen not just as part of a multiroom system but also as standalone wireless speakers. Sonos plans to begin a large-scale beta test of the software later in the year, promising "the most thorough and extensive real-world testing" in order to make sure the experience is "absolutely flawless" before it's rolled out officially. Nick Millington, Co-VP, Product Development at Sonos, said in a blog post announcing the news: "We’ve found a way to deliver all the benefits of SonosNet without a product directly connected to your router. "This new software solution will make Sonos simpler than ever. Start with a speaker and your smartphone, enter your WiFi password and Sonos takes care of the rest. "We will maintain the core function of SonosNet so that – when several players are linked together as a group – they continue to communicate directly with one another, keeping your music in perfect sync. "There are some large homes, where all players are not in the range of the WiFi signal or challenging network environments, that will still benefit from the Sonos Bridge, but our diagnostics and early testing show that the majority of homes will work well with the new software solution." Sonos expects to announce more details of the software beta in the coming weeks.